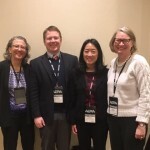 In July 2018, CCRI researchers gave two presentations at the Jobs for the Future (JFF) Postsecondary State Network Meeting. The presentations focused on policies for student success and evidence-based coaching for change. Read more about each below. Panel presenters shared their policy ideas, state examples and, opportunities and challenges in achieving policy change. David Altstadt, Associate Director, JFF. In this session, the CCRI team discussed early learnings from their work on coaching for change (CfC) in partnership with the Student Success Center Network.The CfC initiative enables CCRI researchers to work directly with Student Success Centers to help them design and implement coaching that strategically utilizes applied research, technical assistance, professional development, and various collaborative knowledge-sharing strategies such as communities of practice and networked improvement communities to improve student success. Lia Wetzstein, CCRI Research Scientist.